I had some coconut milk left over from making the Sago Pudding so looked for a meal I cook make with the remainder and found the very tasty Stir-Fried Chicken with Coconut milk recipe by Zoë Harpham on AllRecipes.com. The lime in this recipe adds a delicious fresh zesty flavour to it which makes it incredibly delicious. Grate the zest of the lime and squeeze 1 tablespoon of the juice into a small bowl. Add the coconut milk, soy sauce, ginger, sugar, cornflour and mix together. Set aside. Heat 1 tablespoon of the oil in a wok or large frying pan over a high heat. Add the onion and garlic and stir-fry for 2 minutes until slightly softened. 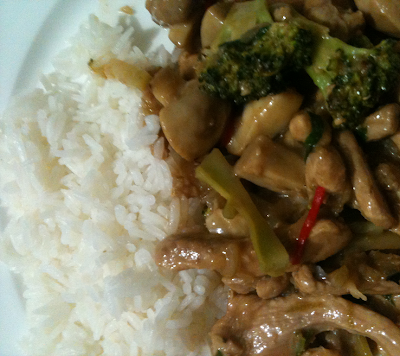 Add the broccoli, mushrooms and chilli and stir-fry for a further 2 minutes. Transfer to a bowl. Heat the remaining oil in the wok or pan. Add the chicken and stir-fry for 2 minutes until light golden. Add the coconut milk mixture and return the vegetables to the pan and stir-fry for 1 minute to thicken. Cover and simmer for 2 minutes, or until the chicken is cooked through and the vegetables are just tender. Scatter with the parsley, toss together briefly and serve with plain white rice. 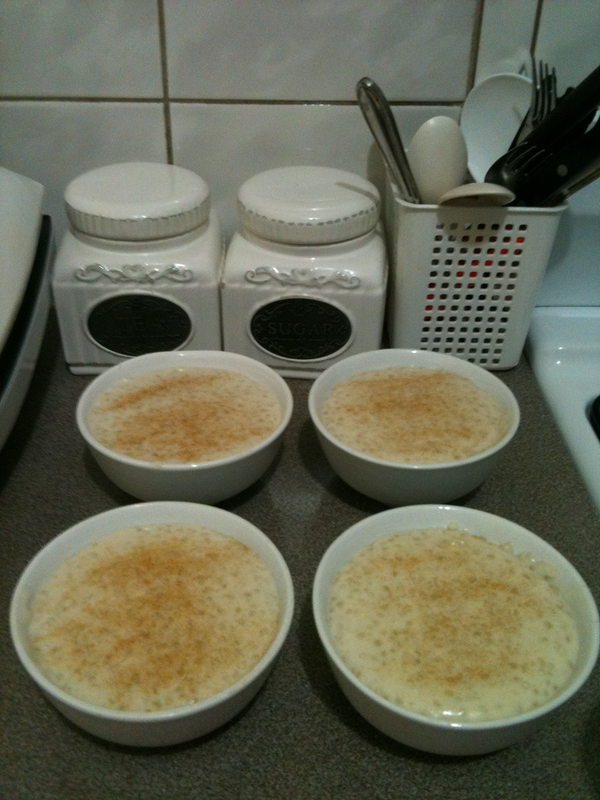 I saw this Sago Pudding recipe being made on the telly but have changed it around because I found some of the ingredients are impossible to find. This recipe tastes best made with rice milk and vanilla paste. It is absolutely delicious. You can also use soy milk and vanilla essence if you don't have those ingredients. This is a very quick, easy and delicious recipe. Soak Sago in water for about 10 minutes then drain. Heat water to boiling in a large saucepan then place sago in and stir constantly to avoid it sticking together. Cook until sago begins to turn transparent. Add coconut cream, rice milk, raw sugar and vanilla paste and reduce heat. Continue to stir sago pudding until it is bubbling, remove from stove and pour into serving bowls. Eat nice and warm or cold it's great either way. I have always wanted to try pork ribs. When I was in the supermarket the other day I saw a small tray that had my name written all over it so I quickly grabbed it and then started thinking about how I would make them. I looked for a pork rib sauce and came across this recipe. Combine barbecue sauce, tomato sauce, vinegar, sugar, garlic and paprika in a shallow dish. Add ribs and coat them all over. Cover with cling wrap and refrigerate for a few hours or overnight if possible. Preheat oven to 160°C. Line a baking dish with foil and place just the ribs on it. Pour a little bit of the sauce over them and reserve the rest. Cover the dish and bake for 1 hour and 30 minutes basting with reserved marinade and turning every 30 minutes. Then increase temperature to 200°C remove cover brush with marinade and bake until they have browned about 10 - 15minutes. 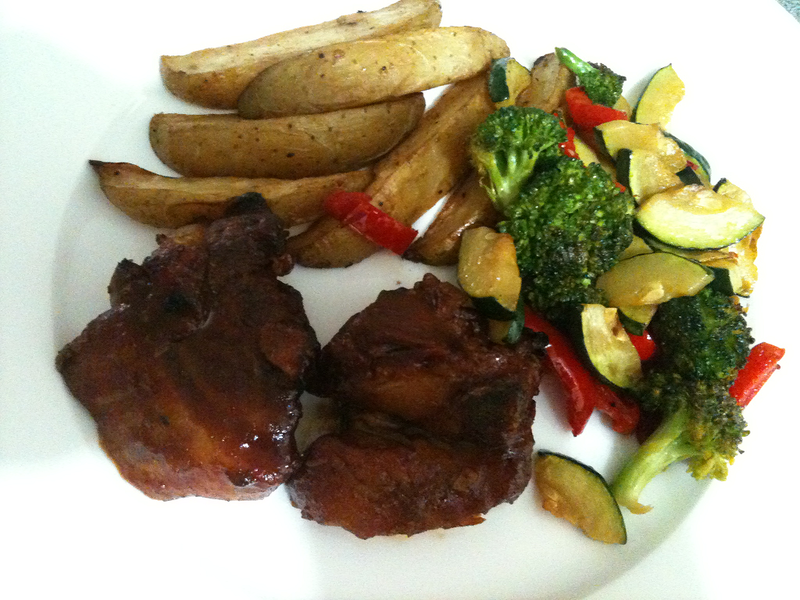 I served my pork with oven baked wedges and steamed vegies. I have never tried any paella recipes before but when I got this paella recipe which is from Curtis Stone I thought I would try it. Usually paella recipes have seafood in them but I had all the ingredients required for this one so I took is as a good sign and decided to try it. I am glad I tried it because this is a good recipe for paella. It is easy has incredible flavour, healthy, and delicious. Want to learn how to make paella? Recipe is below. Let's go! In saucepan, heat water, turn off heat and add saffron. Place large frying pan or paella pan over high heat and add oil. Once oil is hot, add chicken and brown on all sides, for about 5 minutes. Remove chicken from pan, reduce heat to medium high and return pan to the heat. Cook the onion, capsicum, garlic and paprika for 3 minutes, or until softened. Stir in the rice and cook for about 2 minutes or until pan is dry and rice is coated with oil. Add warmed saffron water to the pan and stir to evenly combine. Add the chicken back to the pan, arranging in a single layer, evenly spaced and bring to a simmer over high heat. Once pan comes to a full simmer, remove from heat, sprinkle with tomato and season with salt and pepper. Place in oven and cook, uncovered, for about 30 minutes or until the rice is tender and chicken is cooked through. 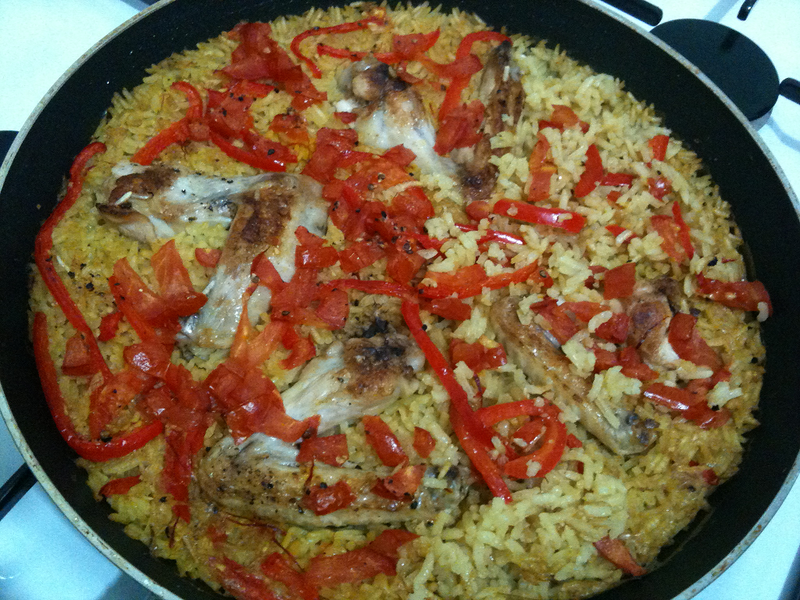 A sign of a good paella is crisp rice around the sides of the pan. 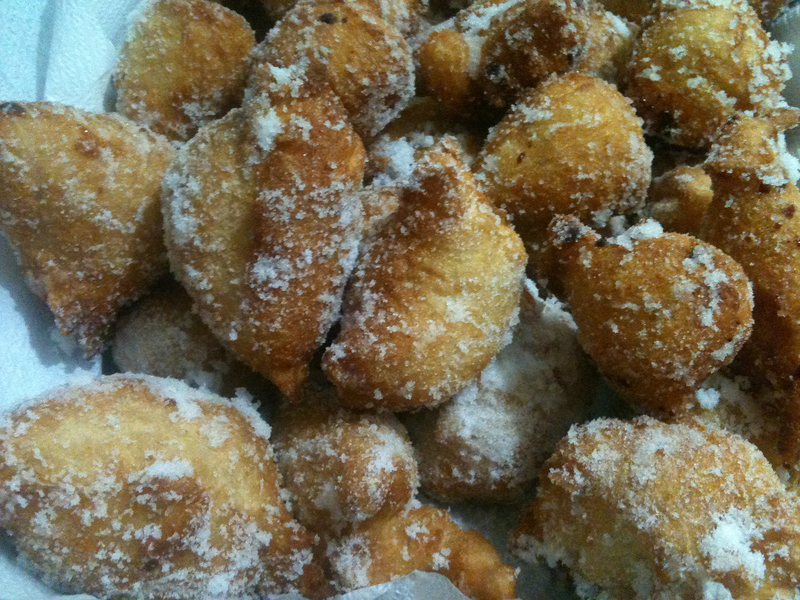 I love Loukoumades. They are a very traditional Greek dish. My mum used to make them for us when we were children. We didn't have them often because they are fattening. 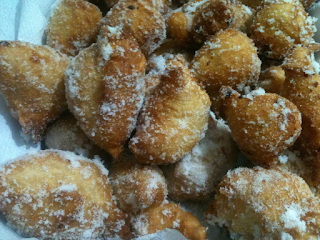 Loukoumades are dough balls fried in oil and rolled in sugar. As you can see they are not very healthy but incredibly delicious. I hadn't eaten any in years until I bought the book A Month in Marrakesh: A Food Journey to the heart of Morocco and found a similar recipe in there. They have Loukoumades as Orange Flower Doughnuts but I recognised them as soon as I saw the picture. Of course I have edited their version to make them Loukoumades. It really is quite easy. Place the warm water in a bowl with the yeast and sugar, mix well, cover with cling film and leave in a warm place for about 30 minutes until mixture forms bubbles and has increased in volume. Place the flour and salt in a large bowl. Make a well in the centre, add the yeast mixture and water (add more if needed) and knead into a smooth elastic dough folding the dough vigorously in from the sides as you knead. Keep kneading and punching the dough for 10 minutes adding a little water from time to time, until the dough is spongy, soft and sticks to your hands. 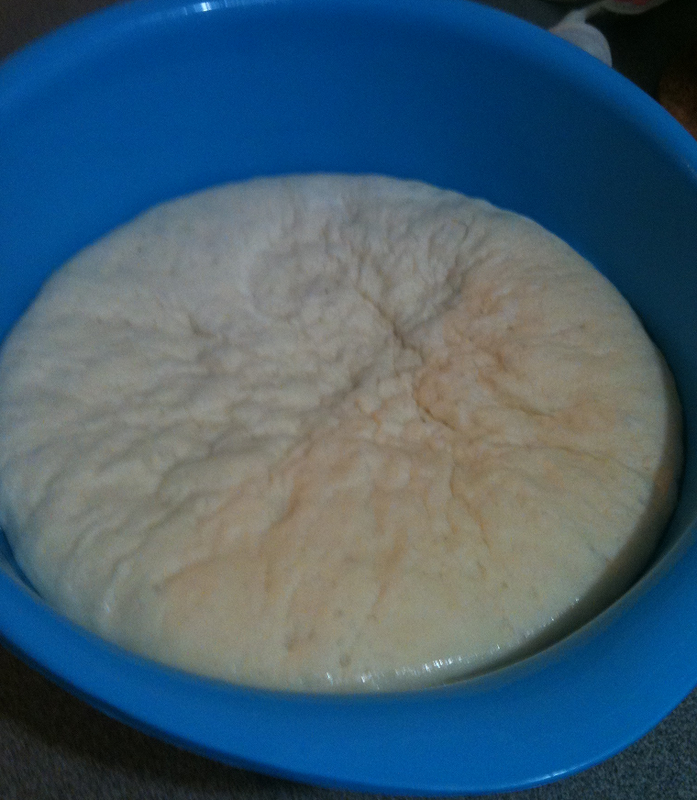 Place in a lightly oiled bowl, cover with a cloth and leave to rest for 2 hours until the dough has doubled in volume. Fill a large, deep saucepan or deep fryer one-third full with vegetable oil and heat. 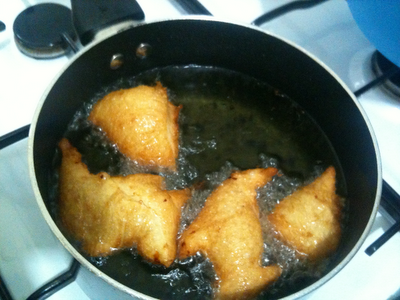 When oil is hot carefully fry tablespoonfuls of batter in batches turning and making sure they are not overcrowded until they swell in size and turn golden brown about 3 – 5 minutes each. Remove with slotted spoon and roll in caster sugar then drain on kitchen paper. Serve immediately. 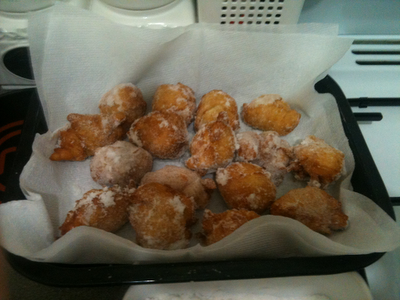 Note: Keep heat low as you cook otherwise oil will get too hot and the loukoumades will burn on the outside and remain raw inside. I got this Spanakopita recipe from the Jamie Oliver 30 Minute Meals cook book. Yes I was surprised to find it in there but thrilled as well. Being Greek my mother made the pastry by hand and made it look quite difficult so I never tackled it but the Jamie Oliver 30 Minute Meals recipe gave me new hope. The first time I made Spanakopita, it was so simple and tasted just like mama makes, it melts in your mouth just like heaven.The second time I made it I took it to a work lunch and everyone requested the recipe. I edited the method as I found it a bit difficult. I also changed it to do it a bit like mama makes. I think the changes I made will make it a lot easier to make Spanakopita recipe. I have also found that I can tolerate fetta cheese better than normal cheese which I don't eat at all. If you are lactose intolerant you should still be okay to consume this. Crack eggs into a mixing bowl and crumble 300gm of fetta then add a pinch of pepper, oregano, lemon zest and half the olive oil and mix well. In a frying pan add the rest of the olive oil, margarine and half the spinach. Stir frequently until spinach wilts then add the rest of the spinach. Once done add to cheese mixture then set aside to cool. Take a 20 or 22cm cake tin with low sides and oil it. Then take three sheets of pastry, lay it out brush with olive oil then sprinkle a small pinch of salt and pepper. Don't worry if the pastry cracks it's ok. Place this along one side of the pan so it hangs half outside the pan. Take another three sheets do the same and lay these sheets half way over the opposite side of the pan. Do this again and lay these sheets in the middle of the pan. Place the cheese mixture in the centre of the pan making sure it spreads to the edges. Then pile in the sheets that are overhanging so they cover the mixture. The rougher it looks the more homemade it looks. It’s not meant to look neat! Place in oven for 15 minutes make sure it is golden brown on top, then turn pita over and bake the other side for another 15 minutes until golden brown. 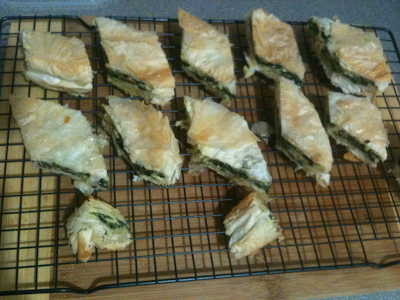 Once cooled take the Spanakopita out of the pan and cut in a diagonal line so you get diamond sized pieces.